Kevin Pilley visits Basel and the world’s largest and luxurious Christmas décor shop – the place for Christmas shopping. Basel, which has suburbs in France and Germany but is mostly in northwest Switzerland, has far more than a munster (cathedral), a rathaus (town hall), a river (the Rhine), a medieval town centre, fortified walls and the country’s largest concentration of museums. It is well known for something else other than FC Basel and the Basel Old Boys. 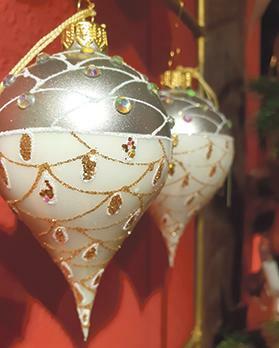 It has a world-famous BaubleMeister which offers the world’s biggest and best Christmas shopping experience. The most expensive single Christmas bauble ever made was made in England and cost £82,000. Johann Wanner is forever selling baubles. He specialises in Weihnachtsschmuck. 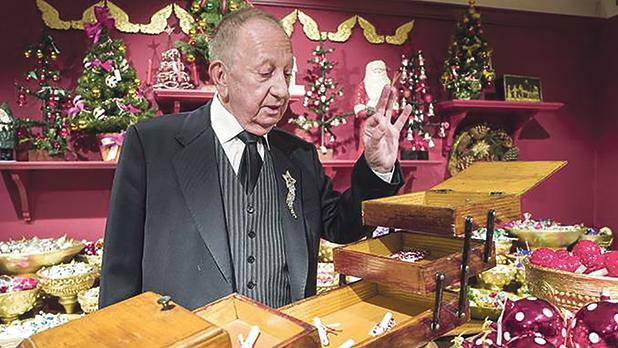 For 46 years, the 79-year-old has been selling a huge variety of bespoke decorations from his magical Christmas House in the Spalenberg district of Basel’s Old Town. 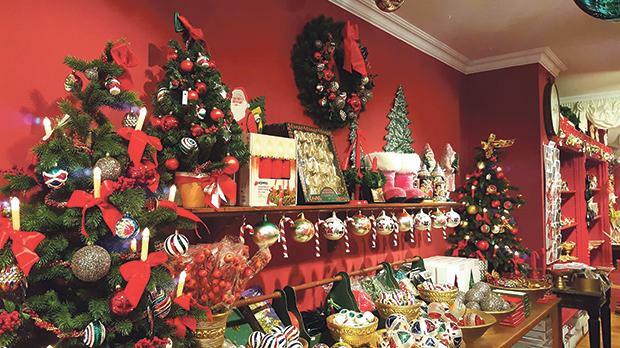 The internationally-renowned shop is the largest manufacturer of hand-made, hand-painted Christmas decorations in the world. It specialises in chic Yuletide tree décor and fashionable seasonal accessories. It sells over 5,000 items. “I dress trees. Not women,” says Herr Wanner, who shares his working life with elves, santas, reindeer, snowmen, mushroom men, tiny conifers, sleighs, jingly bells, festive lights, stockings, multi-coloured pine cones, polka dot toadstools, straw elephants, gift bearers, polar bears, brown bears, lions, monkeys, glass ducks and other tree ornaments. He surrounds himself with angels, wise men, icicles, hand-blown penguins, rose gold owl heads, candy cables, bows, wreaths, holly bouquets, garlands, cribs, corn on the cobs, bananas, pickles, miniature gingerbread houses and gingerbread men, spangly racoons and glittered-up squirrels. There is nothing you can’t hang on your tree or put up at Christmas. Now you can even get gin and whisky-filled baubles. The first tree decorations in­cluded apples, pastries, cakes, gilt pea pods and butterflies as well as flags, bird cages, bunches of grapes and baskets of fruit. Modern mould-blown coloured glass Christmas ornaments were in­vented in the German town of Lauscha in the mid-19th century. Hans Griener produced glass beads and jolly tin figurines. In 1832, a young Queen-to-be Victoria wrote excitedly about her tree and what was under it as well as on it. With her endorsement and that of her German husband, Prince Albert, Lauscha began exporting its products throughout Europe. In 1880, Woolworth’s began selling the coveted, status-enhancing glass ornaments so people could keep up with the Queen. Every year, hotels and department stores compete for the title of the biggest and most expensively-decorated tree. The world record is thought to be Abu Dhabi’s seven-star hotel’s gem-festooned £11m tree. The most expensive single Christmas bauble ever made was made in England and cost £82,000. The ornament industry is currently estimated to be worth over $3 billion. Poland produces Bombki, and Tialpujzhia in Mexi­co is another big producer. Herr Wanner had devoted his working life to preserving the arts and crafts of Christmas. 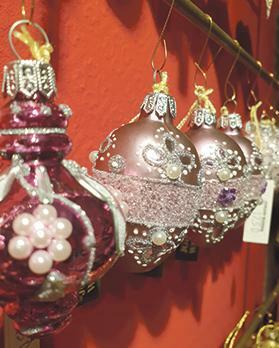 All of Herr Wanner’s baubles are hand-crafted. Using highly-skilled German, Polish and Czech glass blowers, he counts among his satisfied customers the White House, the Vatican, Buckingham Palace and the royal families of Monaco and Lichtenstein. He stocks old-fashioned cotton batting ornaments and three-dimensional Dresdens as well as lametta (hanging tinsel). Modern tinsel was originally made from shredded silver. It is another German invention from estincele (to sparkle). Herr Wanner loves Christmas. His car registration number is ‘X-MAS’. He is a Christmas tree designer. A Yuletide couturier who ‘deals in lines’. He is consulted about tree décor by the rich and famous. These have included Lady Diana and Michael Jackson. Wanner set up the business in the 1960s, when he managed to secure Switzerland’s only licence to buy wholesale from crystal factories in Bohemia, then part of Czechoslovakia. He first sold crystal balls. Wanner calls his stores – he has two – ‘children’s islands’. He admits to getting a huge emotional reward from his work. His fa­vourite bauble is a cork snail he made when he was four years old. Basel’s Christmas market is considered to be one of the most photogenic and ‘Instagrammable’ in Switzerland. Wooden chalets (stalls) are erected around the Historical Museum Barfüsser­kirche at Barfüsserplatz. At the Munsterplatz Market there is a festive children’s village. Christmas decorations are meant to be taken down by Twelfth Night (January 5-6). Leaving them any longer on the tree is thought to bring bad luck. But the man whose shops (including a tea room) in Basle epitomise Christmas shopping is not superstitious.